Choosing the type of mattresses is not only about having a comfortable place to sleep but also to keep you healthy. A sleepless night on an uncomfortable mattress will make you feel unwell and ache in the morning. Also, it will give you back pain. The back pain actually will bother your daily activities. For the children and adolescent, good sleep leads to good growth. Enough sleep can release the growth hormone which can develop your brain, your body cells, and your height. The average age of mattresses is about 8-15 years. So, if you already have your mattress for more than 15 years, you will better check whether it is still cozy or not. However, every mattress has its own ‘expiration date’. Thus, you have to understand the type of your mattress and its specification. Everybody wants the best mattress with the ultimate firmness. But remember, you shall check how much money you have. No matter how firm your mattress is, if you run out of money, you will not have a good sleep in the night. Not all the mattresses that bring comfort to your friend will suit you too because you have different weight with your friends. If you are quite heavy, you can choose a mattress that has more support foams inside it. The support foams determine the firmness of a mattress. And remember always to try the mattress before you buy it so that you can check whether it can support you or not. The mattress has the firmness level from 1 to 7. The bigger the number, the firmer a mattress. If you are a side-sleeper, don’t choose the high level because it will make you feel like drowning. The average people usually choose level 3-5. Waterbed uses water as the filling inside the bed, and vinyl to cover it. There are two types of a waterbed. The first one is a waterbed with a free-flow chamber. And the second one is a waterbed with a waveless chamber that uses water tubes to control the wave. The price of a waterbed is various, from around US$ 48 to US$ 2600. We recommend you buy the waterbed over US$ 500 for its long durability. The good waterbed can last over 10 years. However, you have to know that the vinyl cover itself only lasts for about 5-10 years. You can feel the movement of the water in the waterbed with a free-flow chamber. You will feel like you are swimming while sleeping. Actually, this can be the pros of this bed type: it can relax the spine, and it gives a cool sensation. Also, you can control the temperature of the water. However, in a waveless chamber waterbed, some people find it uncomfortable. Because the water’s wave is quite bothering them. You also have to change the water inside the waterbed (in both types, of course) regularly, so the bacteria won’t grow inside your waterbed. And the last one is, sometimes you will find it difficult to look for the sheet that suits your waterbed. This mattress that will help you reduce your sleeping problem, and help you do some activities in the bed, such as reading, watching television, etc. That is why it is commonly used in the hospitals. To adjust the mattress, you can use the remote control. Pick which side that you want to elevate, foot or head. This is the solution to your headache and back pain as well. You can buy a regular adjustable bases mattress from about US$ 350 to US$ 2500. And it will last about 8-20 years, depend on how common you adjust its bases. The advantage of this type is, of course, you can control and elevate the side you want. Either the head side or the foot side. You can easily control it with remote control in your hand. However, if you adjust it too much every day, it won’t last long. Plus, it won’t suit your children since they can get the accident by playing with this adjustable basis mattress. Innerspring mattress never dies. It is one of the most-used mattress and most-sold as well. The bounciness of coils from this mattress is good for a heavy or overweight person. You can get the innerspring mattress at any prices you want. From US$ 100 to US$ 1000. There are many affordable innerspring mattresses available in the stores. However, the durability is around eight years, and it can be shorter if you have children who love to jump on it. So, it is clear that if you want to look for an economist mattress and want to buy a mattress easily both in offline and online store. The cons are, it has a short lifespan, and it can help you reduce back pain. You feel the ache on your shoulder? You can consider this mattress as the best choice for you, thanks to the soft pad on the top side. The durability of this mattress is so short, only around 3-6 years. However, the price is quite affordable, from US$ 100 -US$ 600. The pros of this mattress are, you can use it to release a headache and the problem on your shoulder. You will wake up in the morning with a nice feeling. The cons are absolutely on its lifespan, so, if you are tight on budget, it is not recommended for you since you have to change it again in a short period. Hybrid mattress gives you a combination of memory foam layer in the top supporting coil (innerspring) and polyurethane foam layer on the base. You can get this mattress from US$ 300 to US$ 1000, but you can’t count on it if you want longevity, since polyurethane has a short lifespan (under 10 years). You can buy a hybrid mattress with a small amount of polyurethane if you want a longer lifespan. This kind of mattresses is quite the same with the innerspring mattress since it has coils in it. However, the coils are surrounded with pockets, so it can reduce the wave once the person on it moves. Therefore, it is a suitable mattress for a couple, especially the new one. The price of this mattress type is various, from US$ 50 to US$ 500. The higher the price, the fewer the motion transfer. The durability of pocketed coil mattress is average, from 7 to 10 years. The pros of this mattress are, no motion transfer. So, your lover won’t annoy you once he/she moves while sleeping. It is pressure relief as well. The cons? It is quite heavy to move, and if the pocket also contains fur, it is not good for you who has allergies. Futon mattress is kind of mattress that is commonly used in a traditional Japanese house. It is made from cotton and is easy to fold. Futon mattress is so affordable. You can get it with only US$ 100 to US$ 300. However, it has a short lifespan, only about 3-5 years. The good points of this mattress are, it is easy to fold and save. You can put it in your closet, etc. It can also save the space, suit a tiny room. However, it has a short lifespan and not as firm as other kinds of mattresses. Specialty foam mattress is filled with one or maybe more foam types in it. Thanks to the foams in it, it is so soft that you want to sleep above the cotton. The price of this mattress is various. You can get it by paying about US$ 100 to US$ 2000, and it depends on the quality of foams. The durability also depends on the foam, from 3 to 10 years. The pros of this mattress are you will feel so comfortable once you sleep in it. It will give you a cool sensation and brings you a good experience of sleeping. However, if you don’t take care of it so well, it is easy to be broken. It seems like gel mattress has the same concept with a waterbed, but actually, both are so different. The gel is infused to the foam with a specific technology, and you cannot just change it like a waterbed. You can get this mattress by paying from US$ 250 to US$ 1500. The durability is about 3-8, not so long, moreover if you use it too much and your children often play in it. The good points of this mattress are, it gives you a cool sensation, and less motion transfer. However, there is also the cons: short lifespan and it is easy to be broken. This is an example of a classic mattress made from foam. It was commonly used in the 80s and 90s. However, you can still find it everywhere nowadays. It is such a mattress that is easy to made and easy to stock in the store. If you are tight on budget, this is a good choice for you. You can get it by paying around US$ 50 to US$ 400. The pros? It is easy to buy everywhere, easy to move, and easy to afford. However, the bad side of it is, it is easy to be broken (the lifespan is about 3-5 years), quite hot, and the odor will bother you. Not a good choice for you who looks for a luxury. Just like its name, this mattress is made from natural (rubber tree) latex or a synthetic one. The price is quite various, depends on the quality of the latex from US$ 100 to US$ 10,000. If it is made from pure natural latex, the price is quite high. Also, never questioning its durability, because it can last for 8-15 years. 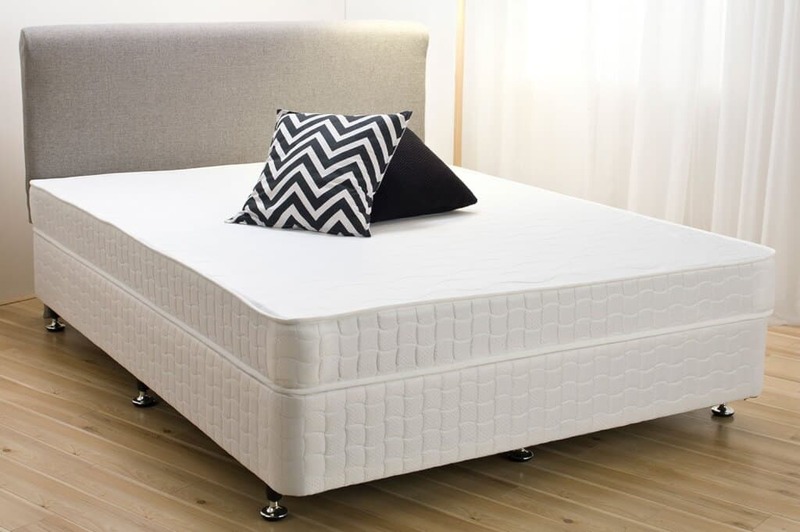 The advantages of this mattress are, it is good for pain reduction, and it is durable. The cons are, it is not as soft as a foam mattress, and it is hotter than other mattresses. This is the most flexible mattress type in the world. You can put it in your bedroom, living room, above the swimming pool, etc. It is quite easy to move since it is inflatable and light. The price for an airbed is various, from US$ 20 to US$ 10,000, and it is based on the durability. Talking about durability, you can keep that mattress from 5 up to 15 years. The advantages of this mattress are, it is easy to move, light, and it is difficult to find the cheap one. You can also use it indoors or outdoors. The cons are, the pumps are quite noisy, and it can bother you. Also, many sellers only give you a short warranty of airbed. All the types of mattresses have their advantages and disadvantages. Remember to be careful when you choose your mattress. Do not hesitate to try and to check all the parts of the mattress and to list all your needs. Because, a good mattress can lead to good sleep, and good sleep will bring you a good life as well.